This is a tea service hand-painted by Beate' of Australia. This normally occurs during the weekends. Your patience is appreciated. 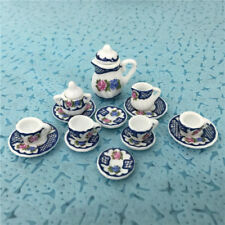 1:6 SCALE PORCELAIN TEA SET 8PCS. Applicable for: 1/6 Miniature Dollhouse. 2~4 10% off at least 1. Material: porcelain. Care Instruction: Keep it dry and cool, avoid sunning. similar tea set. Your kind understanding will be very appreciated! Applicable for: 1/6 Miniature Dollhouse. 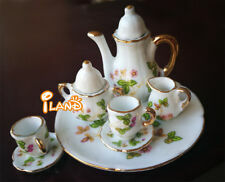 1:6 SCALE PORCELAIN TEA SET 8PCS. 2~4 10% off at least 1. Material: porcelain. Care Instruction: Keep it dry and cool, avoid sunning. similar tea set. Your kind understanding will be very appreciated! Milk jug height 1.5cm. 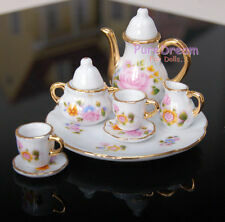 THIS IS A DOLLHOUSE PORCELAIN TEA SET 8PCS. 2~4 10% off at least 1. tea pot height 2.5cm. Care Instruction: Keep it dry and cool, avoid sunning. Including:all the item in the picture. Applicable for: 1/6 Miniature Dollhouse. 2~4 10% off at least 1. 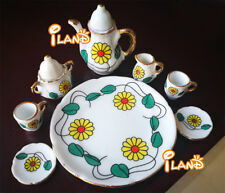 1:6 SCALE PORCELAIN TEA SET 8PCS. NICE COLLECTIONS FOR DOLLS. Material: porcelain. Care Instruction: Keep it dry and cool, avoid sunning. Lot of 8pcs Dollhouse Miniature Porcelain Coffee Tea Set Teapot Cup Plate Dish Kitchen Dinning ware Decor 1: 6 Scale. Applicable for: 1:6 dollhouse. 1 x Mini Sugar jar with cover lid. 1x Mini Milk Container. 1 x Round dish. Material: Porcelain. Colour and Pattern are sent by Random. Care Instruction: Keep it dry and cool, avoid sunning. 1 x Tea pot. Teddy Lingerie. The porcelain tea set is a new type of miniature tea tools. Its design is in line with the trend of reality ceramic tea set. It is the best choice for decoration of Dollhouse. Don't miss it! Quantity : 1 big plate, 1 tea pot, 1 milk jar,1 sugar jar, 2 cup of tea, 2 plates cup of tea. Material : Handmade from clay, Ceramic. Plate Size : 7 x 5.5 cm. Applicable for: 1/12 Miniature Dollhouse. - Material: Porcelain. Milk Container Height: 1.3cm. 1 x Milk Container. - Care Instruction: Keep it dry and cool, avoid sunning. Tea Pot Height: 3.3cm(included cover). Dollhouse Accessories Miniatures Vase Cup Tea Pot Mini Ceramic Miniatures Handcraft. Quantity : 1 Vase, 1 Cup, Tea Pot. Material : Handmade from clay, Ceramic. Colour and Pattern are sent by Random. Care Instruction: Keep it dry and cool, avoid sunning. 1 x Tea pot. 1 x Round dish. 1 x Round dish. Colour and Pattern are sent by Random. Care Instruction: Keep it dry and cool, avoid sunning. 1 x Tea pot. Applicable for: 1/12 Miniature Dollhouse. Care Instruction: Keep it dry and cool, avoid sunning. Note: Light shooting and different displays may cause the color of the item in the picture a little different from the real thing. 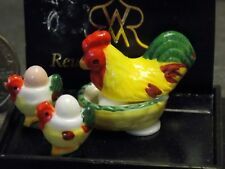 A nice collection of quite rare miniature "Gaudy Welsh" or "Gaudy Dutch" doll kitchen plates. They have wonderful impressed marks and stampings. Beautifully rendered work. Great for a doll kitchen cupboard rack. 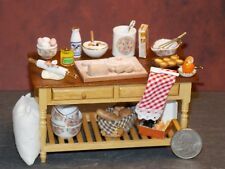 The colorful plates set is a new type of miniature modern ceramic of dollhouse. Its design is in line with the trend of stylish style. It is the best choice for decoration of Dollhouse. Don't miss it!